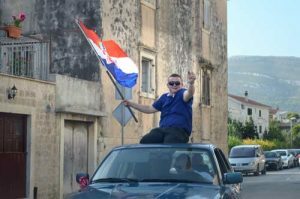 In Kaštel Novi, Kastela a charming outlying district of Split, sits a traditional Croatian restaurant – Konoba Papalina – my review. 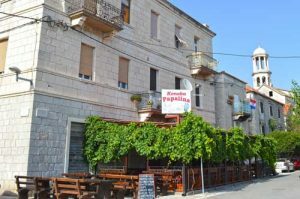 Located right on the Bay of Kastela, in the town of Kaštel Novi is a restaurant called Papalina Konoba. 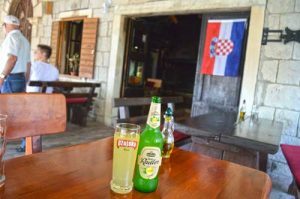 It has an old pub feel and is frequented by locals sharing beers, stories and homemade local dishes of traditional Croatian dishes and seafood. We found the place while visiting Split, Croatia. After finding a conveniently close parking spot, we went for a walk on the Dalmatian Coast waterfront, hoping to work up a bit of an appetite while enjoying the gorgeous views, the smell of the sea and a beautiful sunset. Huge smiles greeted us as we entered the restaurant patio area. When we asked if our dog, Fritz, was allowed, they looked confused and then smiled big again and replied Why Not?! We sat at a corner table and ordered a beer and a radler, which is a refreshing, lighter, beer and lemon mix. Our drinks arrived immediately along with 2 menus in English. 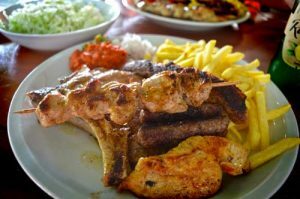 Of course, if you have been reading our previous blogs, it will come as no real surprise that we ordered 2 mixed grill plates with coleslaw. The food was good and the portion sizes were fair. The coleslaw was fresh, crunchy and very good. Unfortunately the bbq meat did not leave as much of an impression as we hoped for. Although it tasted fine, it lacked that intense spicy, smokey bbq flavour which Croatia is so famous for and we have come to love. Note I did not say it was great, although the service was fantastic! Perhaps the biggest disappointment was the feeling it was overpriced for the quality – Croatia style in the summer. Would I recommend it? Sure, the service was excellent, the food was good – and when combined with a romantic waterfront walk on the Dalmatian Coast of Croatia, it is perfection! ? 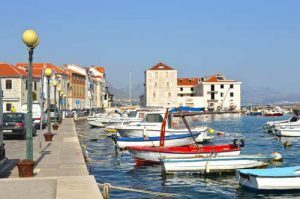 If you arrive by cruise ship, it is about a 30 minute scenic coastal drive from the Split Cruise Port to Kastel Novi, Kastela – do something nobody else is doing! See the sights and enjoy a wonderful traditional meal.